First time in a bed and breakfast? First time visiting the Asheville area? You’re in luck either way. The bed and breakfast experience at the Dry Ridge Inn is far richer than staying in a motel by the highway. You’ll be greeted by your hosts, innkeepers Howard and Kristen Dusenbery, who will help you settle in your room. Wander the acre of shaded grounds and sit a spell in the various places on our grounds. Pause to consider the height of the four-story house, a two-room parsonage built in 1849 and expanded 40 years later by Charles and Sarah Brown, who wanted the tallest house in Weaverville. Imagine how the Victorian farmhouse looked during the Civil War, when it served as a hospital for Confederate soldiers. Walk to the patio off the breakfast room, where water tumbles into a pond full of iridescent koi. Marvel, as you look over the white picket fence, at how peaceful everything is, at how the pleasant neighborhood reminds you of the way small towns used to be. Things are still like that in Weaverville, a quiet town on the outskirts of the much larger, urbane city of Asheville. At the inn, you’ll meet guests from all over and have the chance (or not) to compare notes in the parlor downstairs or in the common areas in other parts of the house. You may find yourself asking another couple to join you the next morning for one of Kristen’s sumptuous breakfasts. You’ll want a substantial meal before you set off for Asheville, one of the country’s most exciting cities for its size. Noted by many magazines and travel websites for its cultural diversity and sophisticated dining scene, Asheville is the leaping off point for great outdoor experiences throughout the Blue Ridge Mountains. 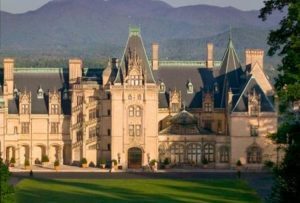 Surrounded by limitless opportunities to hike, bike, paddle and sightsee, the city provides all the necessary balms to so much fun and play – museums, galleries, shops, cafes, the Biltmore Estate and a nationally renown collection of breweries and tasting rooms. Sidewalks full of people, street musicians performing for tips, people excitedly talking about where next to visit – Asheville sprinkles its guests with magic fairy dust, enchanting them and enticing many to stay. And at the end of the day, after so much fun, it’s nice to come home to your quiet room and comfortable bed at the Dry Ridge Inn.